My intention is to share leading edge information for how to end and heal the repetition of narcissistic abuse, an all-too-common relational tragedy in our world today. I will continue to write more about these topics, but before I do, I want to make a bridge from learning about healing, to actually writing a new story for your life. Stage 1: ending the abuse. If you’re really lucky the narcissist in your life will change. But let’s pop the bubble right now: the chances of that happening are slim to none. Do you really want to live inside of a Hope Trip? Probably not. That’s why you’re here. If the narcissist isn’t “too” abusive, you may be trying to figure out how to live (and thrive) while dealing with the relationship’s limitations. Or maybe for you, the only way to end the abuse is to leave the relationship. If this is the case, your physical and/ or your financial security might be at risk and/ or your relationship with your children might be threatened. If this is your experience, please protect yourself. Please get the proper support. The posts I’m sharing are to shed awareness for people who are healing in all 3 stages. My coaching is meant to support those in the latter stages. Stage 2: gaining inner stability. You’ve either removed yourself from the abusive relationship, or you’ve decided you want to stay in the relationship and take better care of yourself (maybe your nark is on the lower end of the spectrum and there are other things at stake). At this stage, you’re feeling your feelings. You’re tuning in to your body’s wisdom. You’re finding your own voice again. You’re giving yourself compassion. You’re learning to end the habit of giving away your power to manipulators. Or to anyone for that matter :-). You’re beginning to balance your superpowers of self-reliance and resilience with receiving support from others and self-care. You’re learning to receive, not just give. You’re learning to trust life again. And others. And yourself. Paradoxically, you can’t learn these things all by yourself. To truly heal, you’ll need to find or create safe relationships where you can experience healthy interactions with others. You’re making mistakes along the way. You’re directing your resilience toward a deep desire to be true to yourself and to thrive. Many people live in Stage 2 for years, even a lifetime. But, hopefully, you want more! The JBL 12 Practices are AWESOME tools that you can apply to your life right now, and then use for a lifetime. Normalizing and embodying well-being is the essense of the 12 Practices. You have amazing gifts inside of you that are probably wanting to emerge. You have awareness. You’re learning to express yourself more clearly. You are seeking the support of like-minded people. You’re ready to expand your freedom and your joy. You know how to keep commitments to yourself. You aren’t perfect, by any stretch, but you are very willing to learn and grow. In fact, you’re finding it fun! If you are in Stage 3, and you’re looking for community, please check out our Treasure Map which lists all of our JBL services. The further you go, the more authentic the conversation gets. 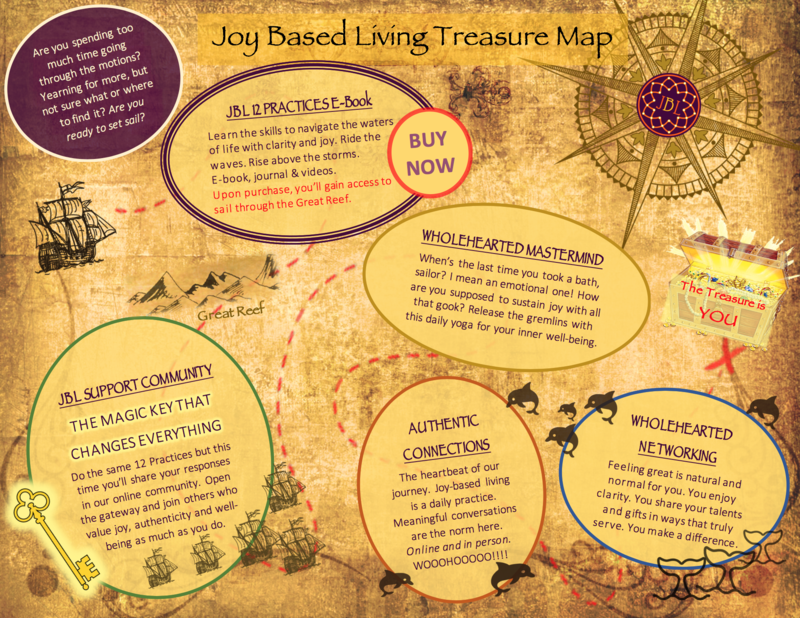 All of my coaching clients are required to navigate the treasure map because this gives them the priceless opportunity to give AND RECEIVE support with others who are also committed to thriving, removing their inner and outer obstacles, and unleashing their full potential! Everyone in the community is committed to applying the 12 Practices to their lives, and this gives us a steady foundation for our conversation. And honestly, journeying together is so much FUN!!! If you feel drawn to experience a coaching session with me, well, just do it! Here’s the link to schedule your coaching session!